The following guidelines for MINIMUM IMPACT SUPPRESSION are for agency administrators, incident management teams, and firefighters to consider. Some or all of the items may apply, depending upon the situation. Managers and firefighters need to ask, "Are suppression and mopup tactics commensurate with the fire's potential to spread and cause resource damage in this land allocation? What tactics are adequate for the behavior of this fire? Are our tactics causing long-term adverse impacts on the land? Will MIST compromise firefighter safety?" One evident tactic is the choice of fireline to use. There are good examples where cattle trails in fine fuels on 30% slopes were used as fireline and as the anchoring point for burnout. There are bad tactical examples in similar or lighter fuels where blade-wide dozer lines were used. In some cases, several blade-wide parallel dozer lines through grass/scab areas were made. Dozer lines are now in places where vehicle trails did not exist, thus opening additional area to possible destructive vehicle use. Good tactical examples exist on easily accessible ground where fire spread was halted by engines driven along the fire perimeter using water for holding and extinguishing fire spread. In similar situations, bad examples exist where dozer lines were constructed parallel to existing gravel roads that could have served as adequate firelines. Another very evident tactic that causes long-term lasting impact and resource loss is tree cutting. A bad tactical example exists in a situation, where up to 400 yards inside the fire's perimeter, living ponderosa pine that had minimum fire in the base have been cut. Instead of using hand pumps and/or dirt, the chain saw served as a means to extinguish the fire from the base of these trees, which often have evidence of past fires extinguished naturally or by some other means. The question needs to be asked. "Even if a tree is on fire and may never be used for timber volume, why is it being cut?" Dead, standing trees are acknowledged as a resource for some specific management objectives. Evaluate each and every suppression tactic during planning and strategy sessions to see that they meet agency administrator objectives and minimum impact suppression guidelines. Discuss MIST with other overhead during operational period briefings, to gain full understanding of tactics. Ensure MIST are implemented during line construction as well as other resource disturbing activities. Use resource advisor to evaluate that suppression tactics are commensurate with land/resource objectives, and incident objectives. Use an assessment team for a different perspective of the situation. Use additional consultation from “publics” or someone outside the agency, especially if the fire has been, or is expected to be, burning for an extended period of time. Adjust line production rates to reflect the minimum impact suppression tactics. Use brush blade for line building-when dozer line is determined as necessary tactic. Leave some trees randomly in fireline. Ensure that instructions for minimum impact suppression tactics are listed in the Incident Action Plan. If helicopters are involved, use long line remote hook in lieu of helispots to deliver/retrieve gear. Anticipate fire behavior and ensure all instructions can be implemented safely. Consider coyote camps versus fixed camp site in sensitive areas. If extremely sensitive area, consider use of portable facilities (heat/cook units, latrines). Emphasize minimum impact suppression tactics during each operational period briefing. Encourage strike team leaders and crew superintendents to provide input on firefighter safety as it relates to MIST. Explain expectations for instructions listed in Incident Action Plan. Consider showing minimum impact suppression slide-tape program or video to the crews upon arrival at airport/incident. Consider judicious use of helicopters-consider long lining instead of helispot construction. Use natural openings so far as practical. Consider use of helibucket and water/foam before calling for air tanker/retardant. Ensure actions performed around areas other than incident base, i.e., dump sites, camps, staging areas, helibases, etc., result in minimum impact upon the environment. Ensure crew superintendents and single resource bosses understand what is expected. Discuss minimum impact tactics with crew. Ensure dozer and falling bosses understand what is expected. If helicopters are involved, use natural openings as much as possible; minimize cutting only to allow safe operation. Avoid construction of landing areas in high visitor use areas. Discuss minimum impact suppression tactics with crew. Provide feedback on implementation of tactics-were they successful in halting fire spread; what revisions are necessary. Look for opportunities to further minimize impact to land and resources during the suppression and mopup phase. Minimum impact suppression is an increased emphasis to do the job of suppressing a wildland fire while maintaining a high standard of caring for the land. Actual fire conditions and your good judgment will dictate the actions you take. Consider what is necessary to halt fire spread and ensure it is contained within the fireline or designated perimeter boundary. Constantly review and apply the Watchout Situations and Fire Orders. Be constantly aware of the surroundings, of expected fire behavior, and possible fire perimeter one or two days hence. Select procedures, tools, equipment that least impact the environment. on the intended bum-out side of the line, fall only those snags that would reach the fireline should they burn and fall over. Consider alternative means to falling, i.e., fireline explosives, bucket drops. Consider using 'hot-spot' detection devices along perimeter (aerial or hand-held). cold-trail areas adjacent to unburned fuels. do minimal spading; restrict spading to hot areas near fireline only. use extensive cold-trailing to detect hot areas. -cold-trail charred logs near fireline; do minimal scraping or tool scarring. -minimize bucking of logs to check for hot spots or extinguish fire: preferably roll the logs. - return logs to original position after checking or ground is cool. -refrain from making boneyards: burned/partially burned fuels that were moved should be arranged in natural positions as much as possible. -consider allowing larger logs near the fireline to bum out instead of bucking into manageable lengths. Use lever, etc., to move large logs. - remove or limb only those fuels which, if ignited, have potential to spread fire outside the fireline. -identify hazard trees with either an observer, flagging, and/or glowsticks. - if burning trees/snags pose serious threat of spreading fire brands, extinguish fire with water or dirt. FELLING by chain saw will be last means-consider falling by blasting, if available. Use existing campsites if available. If existing campsites are not available, select campsites that are unlikely to be observed by visitors/users. Select impact-resistant sites such as rocky or sandy soils, or opening within heavy timber. Avoid camping in meadows, along streams or lake shores. Change camp location if ground vegetation in and around the camp shows signs of excessive use. Do minimal disturbance to land in preparing bedding and campfire sites. Do not clear vegetation or do trenching to create bedding sites. Toilet sites should be located a minimum of 200 feet from water sources. Holes should be dug 6-8 inches deep. Select alternate travel routes between camp and fire if trail becomes excessive. Evaluate coyote camps versus fixed camp site in sensitive areas. be scattered to appear natural. blend area with natural cover. -pack out all garbage and unburnables. aluminum foil, litter). 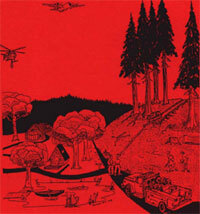 -restore helicopter landing sites. -cover, fill in latrine sites.